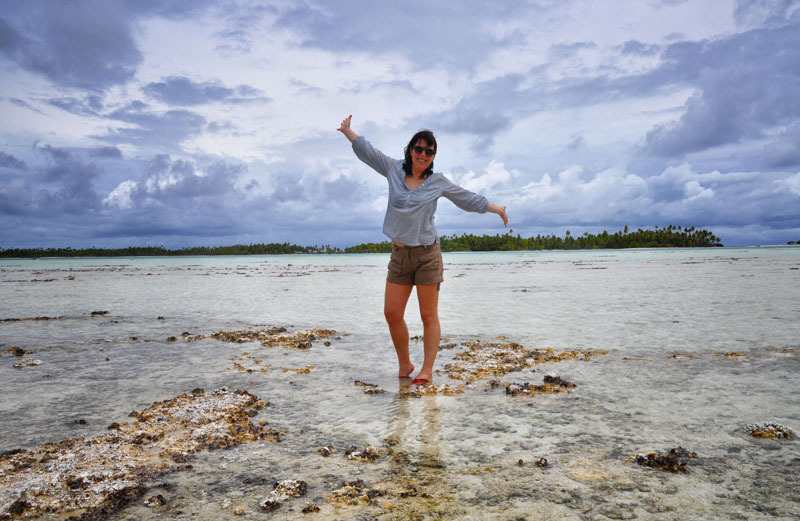 It took us two full days of traveling to get to Rangiroa, and it was all worth it: this string of coral is one of the more low key destinations of French Polynesia and part of the Tuamotus (about 355 km northeast of Tahiti). It’s also one of the most beautiful places in the world I’ve ever been to. Don’t expect much: it has few resorts, some restaurants and shops, and nothing much else. But the lagoon has a luminous jade-green color and the beauty of the place is just beyond imagination. It was already late and dark when we arrived in Rangiroa. I had been awake for two days straight (traveling from Brussels to Paris, to Los Angeles, Papeete and straight on to Rangiroa), and when I finally went to bed I felt like falling into a deep coma instead of just sleeping. And guess what: only two hours later I woke up, full of energy and ready to tackle the world. It was your typical jet-lag. Of-course, when morning came the lack of sleep set in and that midnight Zen-feeling was soon gone. I was speedy and nervous and no way ready for the excursion we had planned: a full day snorkeling and exploring the Blue Lagoon. There were talks of swimming with sharks, but I was so sleepy even the thought of meeting Jaws couldn’t excite (or scare) me. When we reached The Blue Lagoon by boat, I wasn’t prepared for its beauty. The Blue Lagoon is actually a lagoon within a lagoon, filled with eight white sanded motu (small islands) blessed with coconut trees, colorful coral and lots of sea life. The water had the most impressive shades of blue. We didn’t do a lot on this trip: snorkeling, walking from one motu to another, meeting a few locals that were hanging around and just enjoying the scenery. Sometimes that’s all you need. It was our very now little paradise. I went swimming with sharks and still have all my arm and legs. True, these were small black tip reef sharks, absolutely nothing like Jaws, these sharks were not even remotely interested in having me for lunch. After the swim with these beautiful creatures, the crew told me that most of these sharks aren’t dangerous. say what? Talk about lunch: the boat’s crew prepared a lovely BBQ pick-nick with fresh fruit, grilled fish and lots of coconuts. After the lunch they played some music; I first thought I was listening to some typical Tahitian songs, but then they gave a great tropical version of Marina by Rocco Granata, a Belgian musician from the sixties and today again very popular because of the movie that has been made of his life. I knew he was famous, but I’ve never could have imagined hearing his music on a motu in the Blue Lagoon. So, what do you think? Paradise or not? This full day excursion can easily be booked through the hotel. Snorkel mask and fins are provided. Just be sure to bring some reef shoes with you. How to get there? Air Tahiti flies into Rangiroa from Bora Bora, Tahiti and other French Polynesian islands. The airport is located at the main motu Avaturo. You don’t need a car to explore Rangiroa, just a bike (and someone with a boat). I have a quick question. I will be traveling to Rangiroa on a cruise in May, can I book this excursion even if I am not staying at the hotel? What time does it leave and return, I would have to be sure if fit into the ship schedule…….it LOOKS AMAZING! It looks like such a laid-back relaxing vibe there…I need to go! Love the colors! Beautiful photos! And it sounds like an amazing trip to take. How about listening to a tropical version of Marina by Rocco Granata?! I bet you got swept off from your feet. Hi Noel, tx for stopping by. That looks amazing! In theory I’d love to snorkel with sharks but not sure how that would play out in real life. But hey you came back with all limbs! hehe, looks beautiful and a lot of fun! I love the fact that you dealt with jet lag by swimming and floating around in the pool. That sounds just heavenly. Actually, everything looks like it was pretty heavenly. Hi Cindy, it was indeed pure heaven (although I didn’t mention I got a lot of mosquito bites that night :)). My goodness, it really does seem like paradise! Is the lagoon that shallow that ppl can walk to the small islands? So amazing! Yes, it is! You can walk from one island to the other, really beautiful.